SESAM for configuring banks supports an unlimited number of bank branches. Each branch has up to 16 cameras (fixed and PTZ cameras) connected to the SESAM unit, including fire panel, security panel, and access control controllers, which are also connected to the SESAM unit. The bank branches are connected over the banks’ WAN, and the SESAM units are connected by PSTN or ISDN. 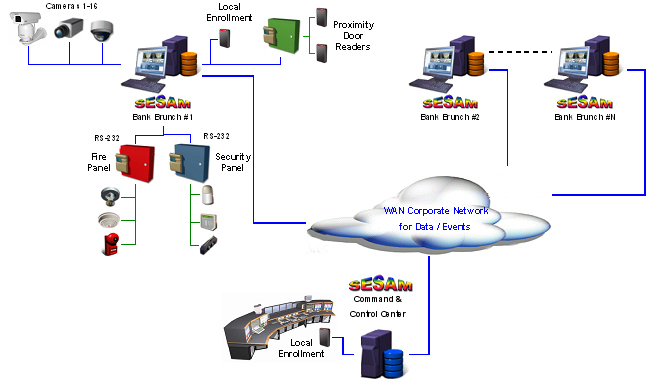 All data are gathered from the branches’ SESAM enterprise server, which is located at the command and control center. Access control Tags can be defined in each branch and uploaded locally, or they may be defined at the Bank Headquarters in the command and control center. The system operator has full access to the command and center to view and control the integrated system of each branch.